The Cities100 report 2019, now in its fourth edition by Nordic Sustainability and C40 Cities which seeks to identify, connect, and communicate the most ground-breaking solutions to the problems of climate change that impact cities today. The final 100 city solutions in the report will serve as a guide to creating the resilient and sustainable urban environments of the future. The Cities100 2019 report is funded by Realdania. 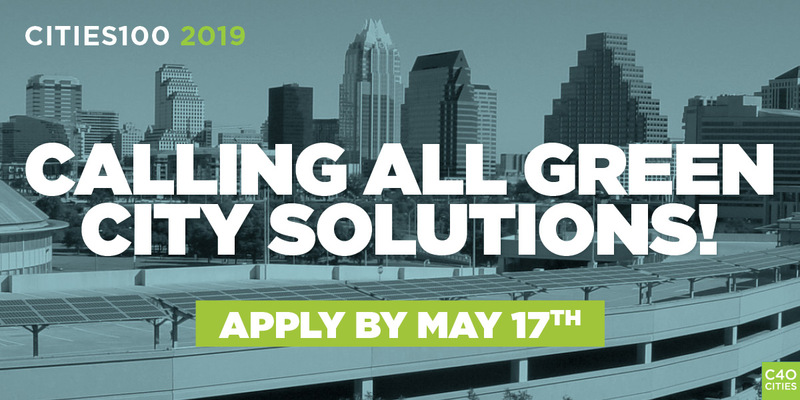 The 2019 edition of Cities100 will provide recognition for 100 of the boldest projects from leading cities around the world working to address sustainability and build a greener future. The publication will highlight solutions that are replicable and scalable, working to lower emissions and address the issues that cities face as a result of global climate change. The final selection of 100 solutions will be announced at the C40 Mayor’s Summit in Copenhagen in October 2019. The application period is now open and will close on May 17. To apply, go here. You can read more about the application process here. • Recognition via the Cities100 2019 publication by C40 and Nordic Sustainability. If you have any questions for the project, please reach out to cities100@nordicsustainability.com.